ShotPak comes in the ready-to-drink segment in four flavours with vodka created cocktails, in addition to four pure alcoholic beverages. All flavours are presented in single-serve stand-up pouches from eco-friendly material. The package, called ShotPak contains a single shot of a tasty liquor in a plastic stand-up pouch. The company is targeting people with an active lifestyle and for on-the-go. Consumers find the eco-friendly packaging attractive, while the price/quality ratio is seen as attractive. 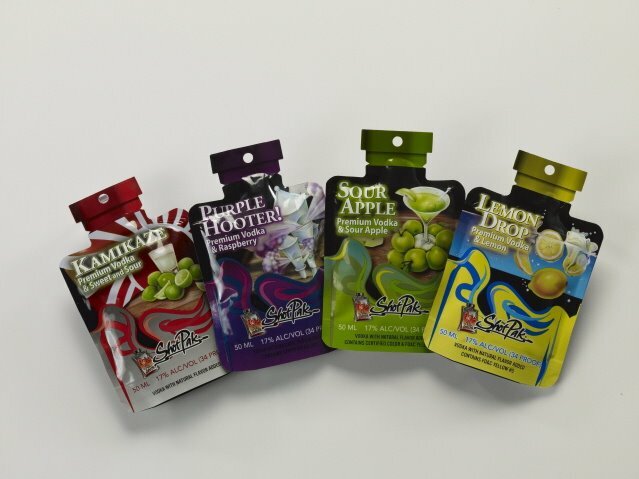 Since 2003 ShotPak, is known for its innovative cocktails and alcoholic drinks in, by the Beverage Pouch Group’s patented flexible portable one-portion stand-up pouches. With the successful launch of four premium vodka flavours and four types of premium spirits in January 2007, ShotPak immediately received national attention in the burgeoning USD 110 billion market for alcoholic drinks, in which spirits show an annual increase of 8.1%. Beverage Pouch Group, founded in 1996 and belonging to PPI Technologies Global, is the main supplier of machinery for stand-up pouches. BevShot is BPG’s contract packing division, where a customer can bring his own recipe and use BevShot’s machinery and process to fill his product into the patented single-shot stand-up pouches.